The Tansy Beetle. Once common across Britain and now only found along a 30km section of the banks of the River Ouse. 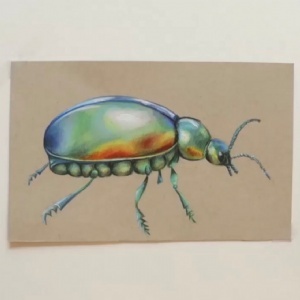 The plight of this beetle and the rapidly decreasing biodiversity of our environment, both nationally and globally, inspired Year 10 student Lily to create a video raising awareness of these issues. Lily's focus is on delivering this message in a way that can be understood by young people, and encourage them into action. The video was released on 26 January and the reaction was instantaneous and enormous. On Twitter alone, it has had nearly 400,000 views, been liked 10,000 times and retweeted over 5,000 times. It has attracted attention from several notable people such as Chris Packham, Caroline Lucas, and Catherine McKenna, the Canadian Minister for Environment and Climate Change. The video is also now being used as an educational tool by schools and organisations all over the world, including a network of schools across Pakistan. “We are currently living through a biodiversity crash in Britain. Our skies and cities are emptying of wildlife, but the topic of our disappearing wildlife is not widely talked about, particularly among my friends and other young people. Because of this overlooked catastrophe, I decided to make a video about the biodiversity crisis to spread the word of it to other people, particularly teenagers like myself. Britain currently ranks 189th out of 218 countries in terms of its biodiversity loss; despite our nostalgic image of the UK as being filled with wildflowers and birds, our reality is empty fields and quiet skies. However, because of shifting baseline syndrome (a phenomenon in which people become accustomed to their current situation and do not notice changes in their environment), we are all letting Britain’s biodiversity crash fade from our minds, right when nature needs us most! With my conservation videos, I hope to make people aware of the loss occurring right now, and encourage people to take action such as by pressuring big companies, eating less meat or creating a wildlife haven in their back gardens or local parks. I began the video six months ago, after realising how blind I had become to biodiversity loss in my local area and how rarely I actually saw any birds or butterflies anymore. 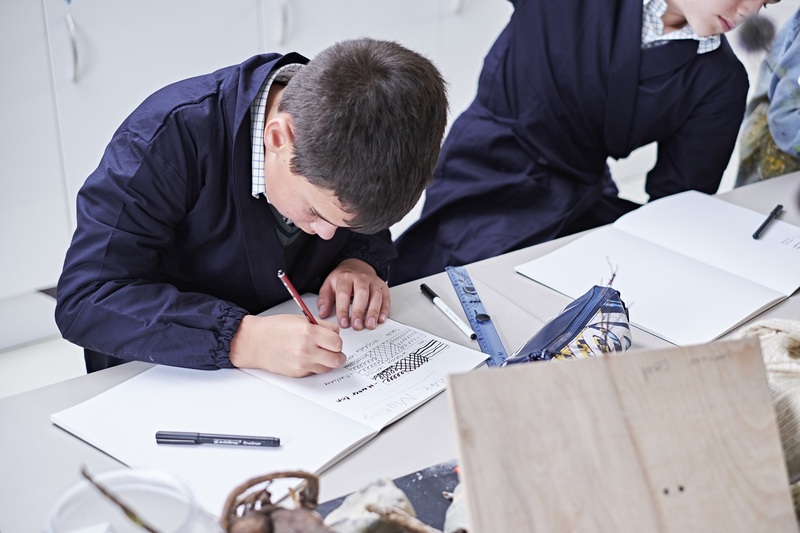 I began to research the issue of Britain’s declining biodiversity, and resolved to create a sequel video to my previous project on plastic pollution. I wanted to use images that would convey the message of the video in addition to being visually entertaining, and so decided on the concept of a fading British species being “un-drawn”, and then rushing back at the end as a message of hope. 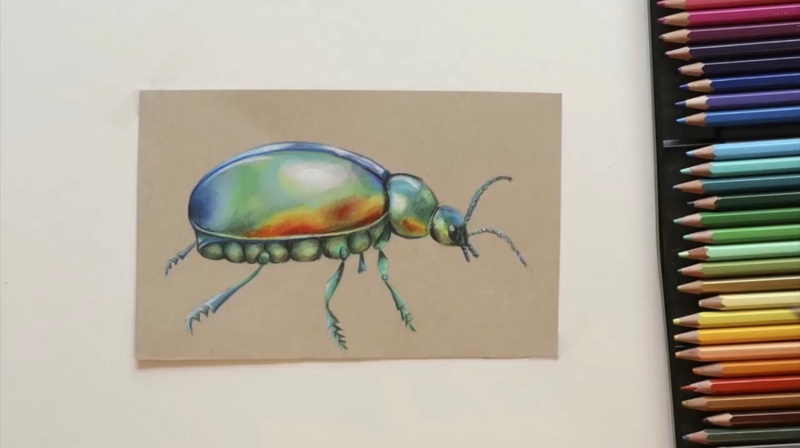 The icon of the Tansy Beetle wasn’t hard to choose; its gorgeous iridescent colours (in Victorian times, their abdomens/shells were used as sequins) and terrifying rarity made it the perfect choice for the video. 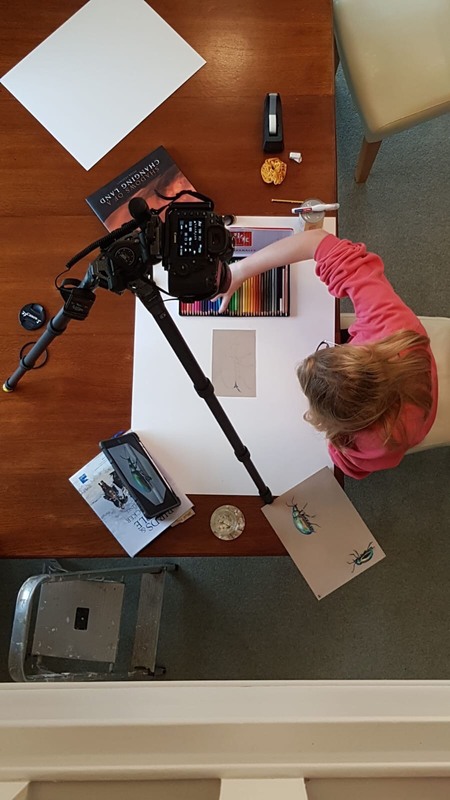 My grandfather very generously helped me to film the video (being a professional wildlife photographer, he had a lot of equipment and skill) and we recorded the time lapse of the drawing together. After many revisions of the voice-over script, I recorded it, added birdsong sound effects and completed the video. Lily is no stranger to viral success. In March 2018, she released a video about the pollution crisis caused by single use plastics. This video attracted over 150,000 views and 2,500 shares, and has been used by charities and schools across the globe. We certainly hope that Lily continues to spread and share these valuable messages with the globe, and that all those who see them are inspired to take action to protect our planet and declining wildlife.